A woman I sometimes chat with during my morning dog outings asked my opinion about an encounter she recently had. She’d been been walking her four-year-old mixed breed dog around a local park when she crossed paths with a man whose dog was off leash. As the owners walked toward each other on the narrow trail, the foot loose and fancy-free puppy ran up to the adult dog. With the usual lack of canine cluelessness that accompanies early dogdom, the pup leaped at the dog relentlessly in an attempt to initiate play. The woman’s dog, while not aggressive, did not want to be bothered. He growled. The puppy didn’t back off, and again tried to engage the older dog. The dog growled louder. The man made no attempt to put his dog on leash. The woman, feeling embarrassed that her dog had growled, ended up apologizing to the man and walking her dog away. The adult dog’s hackles might not have been up during the encounter, but mine certainly were. The woman’s dog had done nothing wrong. She had nothing to apologize for! Growling is a perfectly acceptable canine warning. It’s a dog’s way of saying, “Hey, I don’t like that,” “Don’t come any closer!” or “Please stop what you’re doing.” Being on leash, the adult dog didn’t have the option to leave. He could certainly have snapped at the puppy, or worse. But instead, he gave an appropriate warning. That the puppy didn’t buy a vowel, get a clue, and understand what was being spelled out was a problem, so the dog growled louder. Hopefully that puppy will learn to back off when adult dogs warn him away, before his puppy license expires and an adult dog cleans his clock. And hopefully the man will learn to leash his dog when encountering others. Understanding that a growl is a threat is hard-wired in humans, so it’s reasonable and even advantageous that we become upset when we hear one. But a growl from a dog is actually a good thing. I’m not suggesting that it’s a good thing for a dog to growl at his owner, but growling is a non-aggressive form of communication. Think about it. If someone kept shoving into you on line at the post office, you’d eventually say something like, “Excuse you!” But what if you didn’t have a way to warn the person that you were getting irritated? Eventually, you’d have to resort to either leaving, or physically getting your point across. 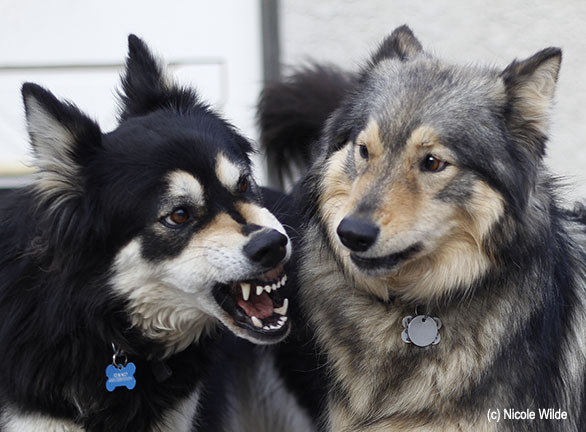 Whether a dog is growling at another dog or a person, it’s simply a warning. If the dog wanted to attack, he would have. Growling is meant to avert aggression, not cause it. But people misunderstand, and punish dogs for growling. A dog then learns that growling leads to being punished and, unfortunately, once his early warning system has been removed, the dog is likely to begin biting with no warning. As a trainer, I’ve seen many dogs like that over the years and believe me, they’re no fun to rehabilitate. If a dog is growling at you, whether the dog belongs to you or someone else, the best course of action at the moment is to defuse the situation. After all, the dog’s arousal level is already elevated. You don’t want to shout or worse, get physical, as those things could lead to a bite. Instead, glance down and to the side (this tells the dog you’re not a threat while allowing you to keep him in your peripheral vision) and back away slowly. Don’t turn your back on the dog if you can help it, as some dogs are more prone to attack from the rear. If the dog in question is your own, address the situation that caused the growling—for example, food guarding—at another time when your dog is calm, with the assistance of a professional trainer if necessary. Remember, growling is simply communication. If we take a moment to assess why a dog is growling instead of automatically taking the attitude that he’s behaving inappropriately, we will react appropriately ourselves.